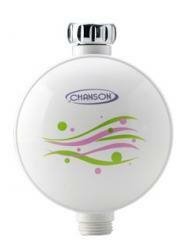 The Chanson Spa shower filter is specially engineered to remove at least 95% of harmful chlorine from your shower water. It is the only shower filter that filters, softens, and energizes the water. The specially-cured crystals in the Chanson shower filter add anions to the water, creating a softer, more energized shower for improved lathering and feel. When the filter needs replacing, no need to throw out the whole filter, just get a package of the SPA Shower Filter Replacement Media.